The highest grade first-day harvest from the high mountain of Fuding county, this Jipin grade is the highest quality white tea we have discovered in China. There are two types of white tea. First you have the Baimudan (White Peony), which has one bud with two adjacent leaves. Then you have the Baihao Yinzhen (Silver Needle), which is 100% tea buds. Covered with downy white hairs, this is the highest quality white tea that is harvested very early in spring. Now, Baihao Yinzhen has many grades too. The earlier the harvest, the higher the grade. Also, the higher grade tends to be made using the traditional sunshine method and does not rely on artificial heating. We first launched the Silver Needle white tea in 2009 and it wasn't until 2014 that we are happy that we have found a Jipin grade that is harvested in the first day of the season! Whether you are drinking tea for its health benefits or its feel-good factor, a white tea has much to offer. A 2001 scientific study conducted by Oregon State University compared white tea and green tea for their cancer fighting potential. It was found that white tea was always more protective than green tea, sometimes by a factor of 5. Another 2009 study conducted by Kingston University in London discovered that white tea outperformed 20 other herbs in youth-ing your skin. For those who are more sensitive to caffeine, there is more good news. White tea contains higher level of theanine due to its cultivars and processing method. Theanine is naturally decaffeinating. It induces a state of mind that can be described as relaxed and yet alert. The presence of theanine also gives white tea the unami taste that can be described as fresh and full-mouthed! Do you know that the most delicious white tea are those harvested in the first day of spring? Fancy having that as part of your mid morning routine? This Jipin grade represents the best of Silver Needle tea. The cream of the crop - it is the first day harvest from the hill of Diantou Zhen, the Authentic Source and birthplace of the Da Bai white tea. Only a small quantity is available each year. A seventy mou (acre) tea farm produces only 25 kilograms a year. Handpicked and made using the century-old sunshine method, she has a rich and mellow body. The best white tea we ever had, the liquor is shining yellow, thick and viscous, a delight to behold. The body is strong and yellow, reminiscent of a fine black tea, made possible by the sun drying method. But most remarkable is the aftertaste, which is sweet and fragrant, sign of a truly top grade. For a long time, white tea was China's best kept secret. Connoisseurs love it - she is widely praised as one of the top teas in China. But within China, few people know about it. She is mainly grown for export. It wasn't until 2013 that the Chinese people in the street finally caught on and guess what? While we have been drinking freshly harvested white tea for years, how about drinking an aged white tea for a change? Believe it or not three-year-old white tea is now in heavy demand in China. The saying goes: "One year old is a tea, three years old is a medicine, seven years old is a treasure!" What makes a white tea suitable for ageing is that she is processed differently from a green tea. Tea enzymes are not destroyed during the making process, maturing the tea has the effects of enriching the taste and aroma, making it more mellow and harmonious to drink. This is my favorite variety of tea. I have bought it many places from many vendors throughout the USA for many years. I first bought the small 50g amount from amazing-green-tea.com to test it. There was a shortage in USA and I could not find more in any of the stores in the city I live in. I had to order some online. I don't know why I ordered it from this website, but I'm glad I did. It took about 27 days to receive the tea. By that time I was able to find a small tin of the same variety in my city, it was organic Rishi brand Fujian Baihao Yinzhen Silver Needle at Whole Foods here in USA. I compared the two side-by-side, and this one from amazing-green-tea.com BLOWS AWAY the Rishi brand! OMG - the Rishi brand seemed very good and satisfying until I tried this one, now it seems flat and bitter and uninteresting. It really does taste quite different. I love your Fujian Baihao Yinzhen (Silver Needle) tea. It has a savory flavor that haunts my dreams! I love it so much that in the past 3 months I have ordered 700g of it to stock up for winter! When the first batch of 2013 comes in in April/May I will be buying at least another 350g. I find that this tea is always sweet and savory and it is very easy to brew. I have never "scorched" the tea leaves no matter how hard I try. I usually brew at maxium heat but I have tried medium heat and it works as well. This Tea is beautiful, tastey, healthy and idiot proof, perfect! The Silver Needle is a 5/5 easy. I never imagined a Tea could taste like that! It is unlike anything I have ever tasted and is very hard to describe. Just wanted to let you know I continue to enjoy your fine quality tea even though I don't generally provide reviews anymore as I have tasted most of them. It really is a great pleasure to drink your teas every day, and both myself and my father (who orders from you as well) enjoy them immensely. We are both very glad to have found your company and will continue to support you by ordering our tea only from you. I can say that I had not tried your Baihao Yinzhen tea before this last order, and that was the selection I picked to drink first. Although the distinctive taste took a few days to get used to, once that happened, I really began to enjoy it. I have been drinking it at work mid-morning and mid-afternoon and really do find that it sharpens my mind, helps me focus and give me energy without any jittery caffeine-style effects. A very nice tea with a sweet aftertaste on the tongue that lingers quite a while. I always look forward to drinking it each day. Of the four teas that I purchased, I started with this one after reading up on it again on your website. I decided to go for the higher content of antioxidant and was interested in seeing if one could have an alertness in a tea at the same time a calmness. I am sold on it! This is the best, freshest tea I have ever had and yes I feel more alert but not jittery and not over active with caffeine. The buds are something I have never seen or experienced. I absolutely love it and will keep buying it. However, I see it is only harvested over 6 weeks a year. I have not opened or tried the other three teas that I purchased because I want to keep them as fresh as possible until I am ready to open and try them. I really, really enjoy this tea and understand now, why there are tea ceremonies. Thank-you for making this tea possible to us outside of China. Thanks so much for your message. I had four friends come over for a brunch the weekend to start plans for the tea tasting we hope to do while here in China. We tried the white tea you sent, the Baihao Yinzhen. They loved it! Everyone thought it made them feel very mellow. Afterwards I served some no-name loose green tea that I bought from a street vender while visiting the Hakka houses. I like it, but they really preferred the white tea you sent. I gave everyone one of the small red packets of lapsang tea you sent. 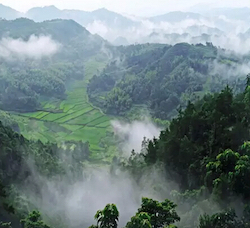 Next weekend we are planning a trip to Anxi to see the tea plantations there, so I'll ask them how they liked it then. On a scale of 1-5, I would give the Baihou Yinzhen a 5.....my friends really liked it. It changed the entire energy, mood of the morning for them. Contrary to what many people believe, white tea is not as delicate as green tea due to its fat tea buds. Brewing at close to boiling point is recommended. To get the full fruity flavor to emerge, you need to use the full amount of leaves at a concentration of 3 grams per 8 ounce (225 milliliters) water. For everyday consumption, you may use 2 grams of leaves at a time.